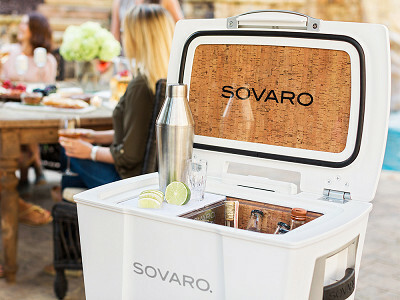 Sovaro makes goods destined to be the centerpiece of a good time, and their luxury cork cooler certainly can’t be ignored. It’s Made in the USA with an eye-catching, high-gloss finish and there’s a surprising, elegant lining inside—cork. Cork is naturally insulating, so it’s as functional as it is beautiful. A clear shield lets the cork shine through while protecting it for years to come. The design can store wine bottles upright and to keep things organized and presentable inside, there’s a divider, too. Add the clear prep tray and you’ve got the best looking, wheeled mini bar around. The same sleek aesthetic applies to Sovaro’s double-wall vacuum insulated drink tumbler. It mimics the cooler’s glossy finish, durability, and clever design. The shatterproof lid has a one-click, drip-free closure for easy on-the-go use. The cooler and tumbler both look—and feel—leagues better than your everyday solutions to storing food and drink. Hello everyone! I'm proud to introduce Sovaro coolers and tumblers to The Grommet. Sovaro embodies your sophisticated approach to entertaining in style. With an eye to serious style that is elegant in its simplicity, Sovaro luxury products accentuate every unforgettable experience. We stand committed to exceeding your expectations through exceptional and innovative products and experiences that are thoughtfully designed to complement your style for years to come. Our team is happy to answer any questions you have! Cheers! I love the cork insulated cooler concept! how many bottles of wine does each size hold? @kate We love it too! The 30 quart size holds approximately 8 standing wine bottles, while the 45 quart holds 10. @kate Hi Kate, I am so glad you like the coolers! 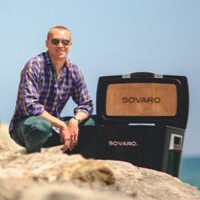 Sovaro coolers were designed with a spacious interior height of 13.5 inches, which will allow wine bottles to stand upright even after the bottle has been opened and recorked! The 30qt cooler holds 8 bottles upright, the 45qt holds 10 and the 70qt holds 18. Cheers! This looks awesome!! How heavy is the 45 quart cooler? @Gina Thanks for chiming in! The 45 quart version weighs 39 pounds, while the 30 quart weighs 32 pounds. @gina Thanks so much! The 45qt cooler weights 39lbs, but the luggage style handle and wheels makes it very easy to maneuver. Enjoy! 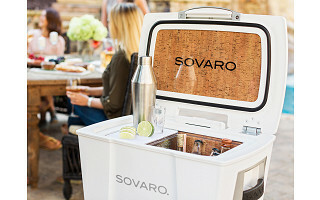 Sovaro makes goods destined to be the centerpiece of a good time, and their luxury cork cooler certainly can’t be ignored. It’s Made in the USA with an eye-catching, high-gloss finish and there’s a surprising, elegant lining inside—cork. Cork is naturally insulating, so it’s as functional as it is beautiful. A clear shield lets the cork shine through while protecting it for years to come. The design can store wine bottles upright and to keep things organized and presentable inside, there’s a divider, too. Add the clear prep tray and you’ve got the best looking, wheeled mini bar around. The same sleek aesthetic applies to Sovaro’s double-wall vacuum insulated drink tumbler. It mimics the cooler’s glossy finish, durability, and clever design. The shatterproof lid has a one-click, drip-free closure for easy on-the-go use.